Honda’s Variable Valve Timing & Lift Electronic Control system, known as VTEC instead of the more accurate VVTLEC, is one of those things that various parts of automotive pop culture have glommed onto, and as a result, almost everyone with even a passing interest in cars is aware of VTEC and its propensity to kick in, yo. While it’s widely understood that it has to do with valve timing, do you know exactly how it works? Engineering Explained does, and they’re here to, you know, explain. Fundamentally, VTEC is a technology that deals with an engine’s intake and exhaust valves, controlling the volume (and speed) of the gases that enter into and exit the cylinders. The ‘V’ in VTEC means “variable” because unlike most engines that have a set amount the valves open, VTEC-equipped engines can choose between two different amounts that the valves open. 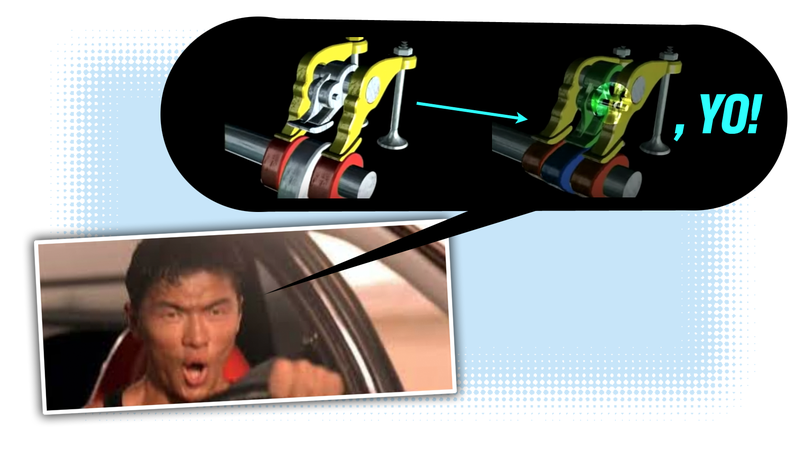 The way VTEC does this is via a camshaft that has two different cam profiles that open the valves. At lower speeds and engine revolutions, the two small outer cams actuate the valves, but at higher speeds/RPMs higher oil pressure is used to force a piston to lock rocker arms together and, when locked, have a surface that contacts the high-speed center cam, which provides for greater valve opening sizes.